Secretary of State Hillary Clinton says she wishes aid and relief would get to Haiti quicker, but recognizes the difficulties. Clinton adds that it is "really remarkable how much we've gotten done"
Clinton notes Haiti government buildings, officials "grievously damaged"
Washington (CNN) -- Secretary of State Hillary Clinton said Wednesday she is "of course" not satisfied with the pace at which relief supplies and personnel are getting into Haiti, but added she is "aware of the difficulties" involved. "There were so many challenges that had to be addressed all at once" after the earthquake that it is "really remarkable how much we've gotten done," she said as she answered reporters' questions at the State Department. "But when the principle instruments of authority and assistance dealing with the Haitian government, the United Nations, MINUSTAH themselves were so impacted, we really had to start at the very beginning," she said. MINUSTAH is the French-language-based acronym for the United Nations Stabilization Mission in Haiti. "Frankly, if you look at the whole, broad context of what we've been able to do, I think that, overall, it's an heroic, historic effort," Clinton said. She also defended the work of Haitian President Rene Preval, who has been largely absent from the public eye in the aftermath of the quake. 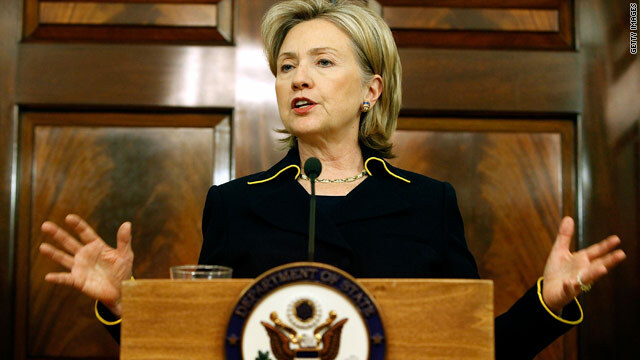 Asked whether the need to coordinate relief efforts with a decimated governmental structure might have slowed relief efforts, Clinton conceded the government of Haiti was "grievously damaged" by the earthquake, both in damage to government buildings and in the loss of government officials. "However," she added, "President Preval, the prime minister and those ministers who have been working with him meet every morning and every afternoon. They are deeply involved in coordinating not only with the United States but with the United Nations and other countries and donors as well." When asked about her level of satisfaction with the pace of the relief effort, Clinton said, "Of course I'm not satisfied with getting material and personnel in for everyone who needs it," but "realistically I am aware of the difficulties that this terrible natural disaster has posed."